Moragad FortHeight : 4450 ft.
Geographically seen, Moragad is just a part of fort Mulher. It is actually the second bastion of Mulher. The height of this fort from its base is about 4450 ft.
No available artifact speaks specifically about this fort. While walking towards the fort-top there is a cave near to the second garrison. The top of the fort can almost be called a plateau. There are a couple of cisterns and a beautifully built reservoir. Remains of some residential buildings have stood the test of time. Apart from this there is nothing interesting to be seen on the fort. 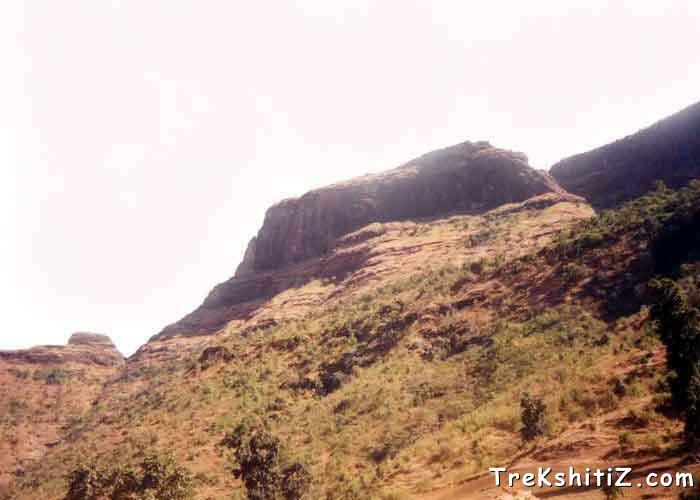 However, one can have a bird's eye-view of the Mulher plateau as well as the fortified spur, fort Hargad, Mangi-Tungi, Nhavigad, Tambolya and Hanuman Tekdi. There exists only one route to reach the top of Moragad, which goes from the bastion on fort Mulher. The path starting from the Someshwar temple also joins this route later. To start from the bastion on fort Mulher, take the uphill path on the right while facing the temple of Bhadangnath. On climbing a few steps in this direction one can see below the route going towards Moragad. About half an hour's time is sufficient to reach Moragad from this spot. There are three garrisons on the way to the fort-top. There is no suitable place on fort Moragad for an overnight's stay. However, one can stay on fort Mulher. There are water-cisterns on the fort. However, they are always dry in summer.